Redshirt freshman Jerrod Heard had 527 yards of total offense against Cal. The extra point kick in college football, taken from the 10-yard line, is the most basic and near-automatic of plays. So when Texas’ Nick Rose lined up to punctuate the final scintillating touchdown run by Jerrod Heard with the kick that would tie the Longhorns’ game with California with 1:11 to play, coach Charlie Strong didn’t even bother to watch what was happening on the field. 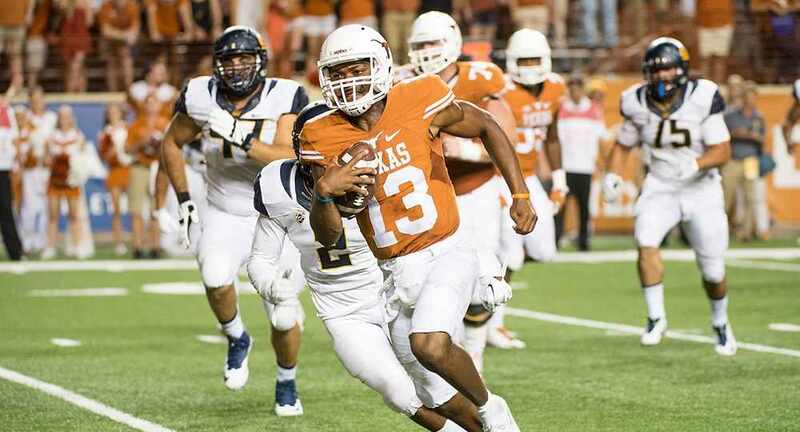 Rose had his PAT partially blocked and it missed wide right, securing Cal’s 45-44 victory over Texas before a feverish, and then stunned, crowd of 91,568 fans Saturday at Darrell K Royal-Texas Memorial Stadium.